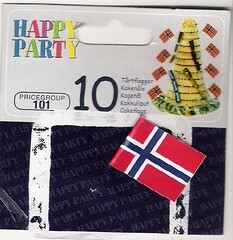 A packet of cake flags from a Norwegian supermarket. I stole these two drawing pins off the Lillehammer notice board. Such a great design. The pin is made from the punched out triangle. 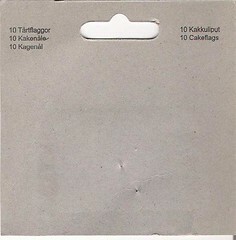 I searched for a box of new ones, as they seemed to be used everywhere...but to no avail. On our recent trip to Norway we had a day trip to Lillehammer. 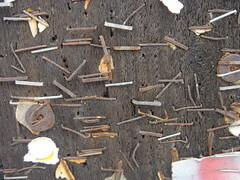 This is a photo of a small section of fence that the locals were using as a notice board. 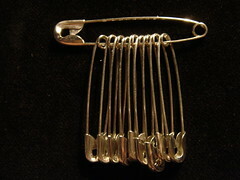 200 safety pins for a pound! 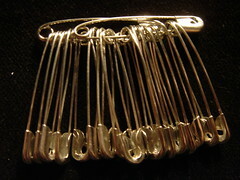 Mass Production of metal pins amazes me...how can you make so many so cheap? There was a machine at a steam fair in Tabley that just cut wire to a certain length ready for pin making.. The safety pin is such a great design. They are so useful they can even hold themselves together.